My baby boy had his half birthday! 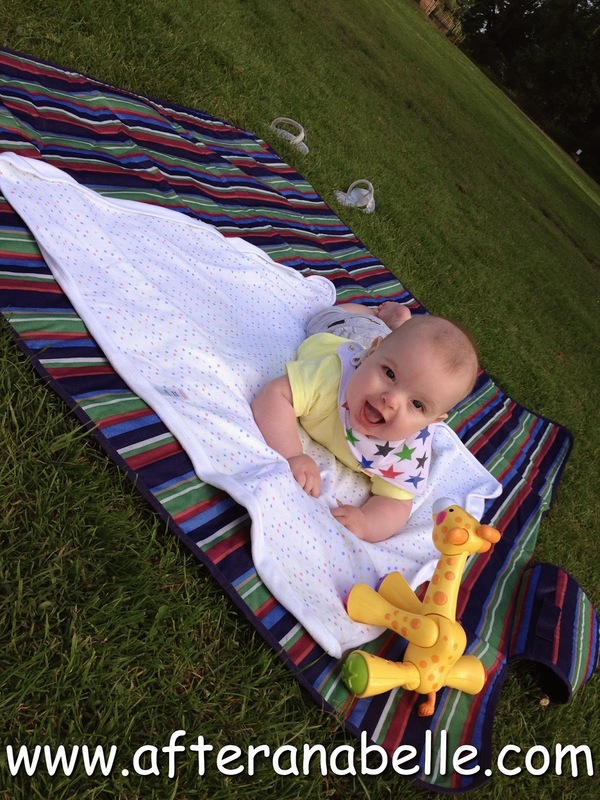 He celebrated the day by having his first breakfast (baby banana porridge), having a new toy (the Fisher Price animal train) and a lovely afternoon spent at the boating lake having a walk and a little go on the swings, and then moving out of his moses basket into the travel cot. Oh how I wish time would slow down just a bit. This maternity leave is flying by, these baby days are flying by. This month I'm feeling pretty exhausted. After saying nights had improved, no sooner had I said it, then they deteriorated again. A good night is currently two wake up; although three, even four wake ups are more usual. Up until his half birthday he was still in the Moses basket, (yes he did look ridiculous), the poor boy was fairly squashed, but with an imminent house move we expected to be sooner than it has happened (I'll do a post on this soon! ), we were just trying to stretch him out in the moses without needing to build the cot, to then dismantle, move and build again. He had been happy enough in there until just after 5 months old, but the last few weeks he was spending much more of the night in bed with me, than he was in his moses. So we admitted defeat, and have come up with the travel cot as a half measure for the next few weeks. We hoped the extra space in the travel cot would improve the night wakings, but no, it appears this boy is not going to be a 'sleep through the night' kind of baby anytime soon. Nevermind. The gorgeous boy he is makes up for all those difficult nights, even if I am pretty desperate for more than 2-3 hours sleep in a row now! My darling boy, you are half way to your birthday and I can hardly believe it, before I know it I will be planning that very special day for you. Your first year is going so fast my baby small. 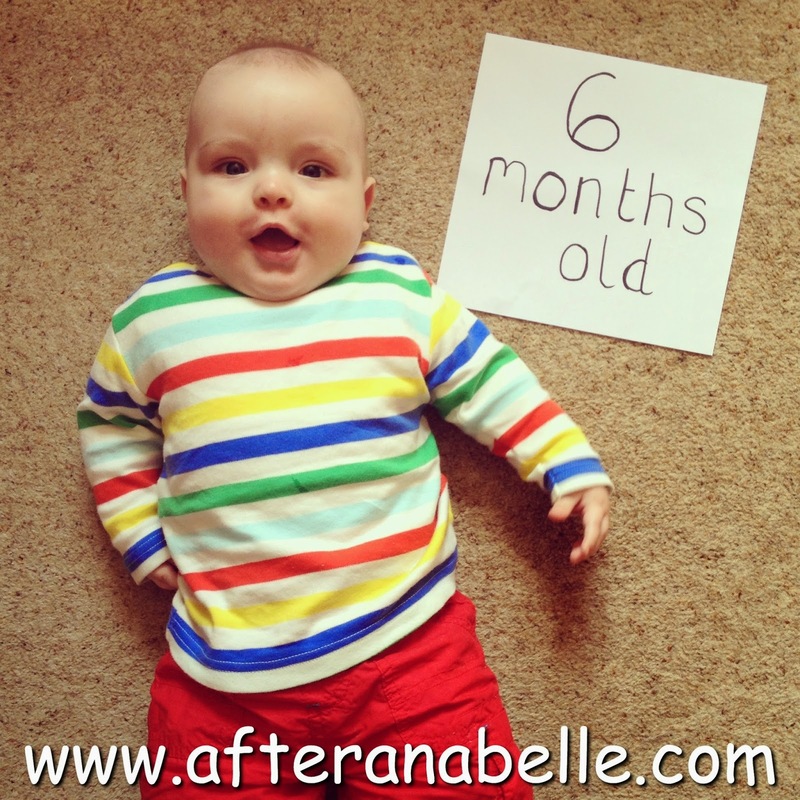 At six months old you are 18lb 4oz and have already been in your 6-9 month wardrobe for almost three weeks already! And your eyes have changed. They are beautiful dark blue, but in the middle there are little flecks of yellow and green now. Really beautiful. So you're eating little one! Not very much but you're enjoying what you've had. I think you're going to be messier to wean than Xander - you are already much more eager to be holding the bowl and the spoon and giving this feeding thing a go yourself. You've had a week of breakfast so far and this week we introduced tea as well but you really are only having very small portions at the moment. From the offset your brother wanted more and more food - crying when the bowl was finished, but you have started off more slowly - much happier being a milk monster than food monster just now. I'm sure this will change soon enough! 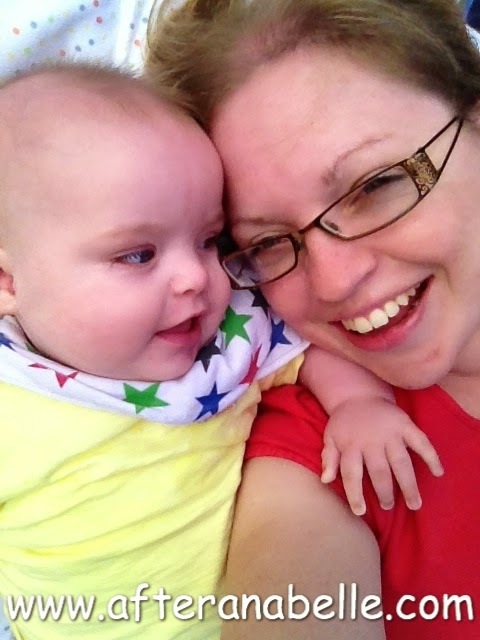 This month you've become very attached to Mummy. Not wanting me to be very far away, even when you are with Daddy. My little baby small - at the moment you really are Mama's boy! Well, when you're not being your brothers boy! You two are going to be as thick as thieves - you spend so much of your day unable to take your eyes off him. 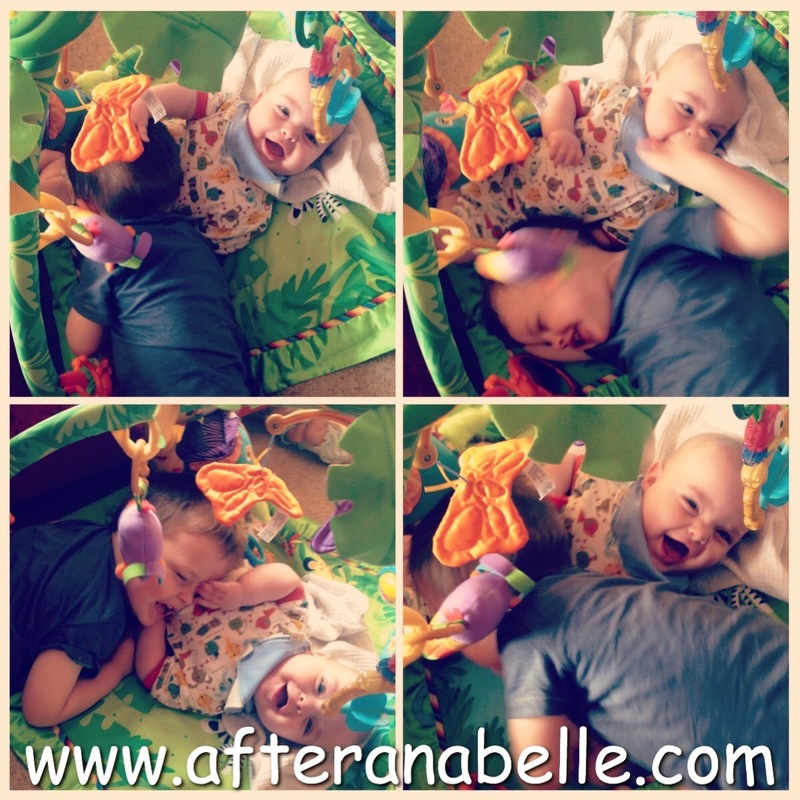 This month you have really discovered rough and tumble play together - lying on the floor and Xander will tickle your tummy, you will squeal and grab out at him, pulling his hand towards you, or pulling his hair or face. So he lies his head on your tummy which you think is just wonderful. You are getting stronger all of the time. You are getting very good at sitting by yourself and having a good go at some sort of forward motion when you are on your tummy. If you could only co-ordinate yourself a bit more I'm sure you would be army crawling! You try so hard to push yourself forward by lifting your bottom and pushing your feet. You finally rolled little one - from your tummy to your back - but of course, every time I try to catch it on video at the moment you get grumpy and cross. After months of trying you still haven't *quite* managed to roll the other way - you are just a smidgen away from managing it. I can't believe how many times you have been practically there only to flop back onto your back! You are far too happy being stationary at the moment to worry about moving too far! You love lying on the floor to play and watching the world go by. I'm not complaining - I know there will be some real chaos when I have two mobile boys! This month we have discovered you are getting ticklish. It is very funny. Daddy has been tickling you just under your arm pits and your squirm and squeal and laugh. Just beautiful. We've also discovered you think Timmy Time on Cbeebies is very funny, you gurgle and laugh along to that too. You are just so fascinated with everything in life at the moment - this must be the best bit about being small; for you and Xander everything is a little adventure. I love that. Fiz has discovered you and insists on sitting next to you on the bed at every opportunity. You seem to love her soft fur and pull at it in clump-fulls. I think she secretly loves the attention you give her - although she would complain at such rough handling from anybody else! Your favourite things at the moment are sucking and chewing on your fingers or muslins. And wet wipe packets - you love crinkly things at the moment, so wet wipe packets, your Ladybug are your favourite toys just now. Nappy changes are spent with you scrunching the wetwipe packets in your hand and your equally fascinated scrunching the Ladybugs wings. You really are becoming a little baby boy now, a wonderful little boy.